GEOSYNTHETICS are widely used in infrastructure but they aren't widely studied. They are only a small part of engineering education at universities, if they are presented at all, and certification and professional development opportunities are still relatively few. This is troubling given the critical functions they play in projects such as landfill lining, brownfield capping, and highway retaining wall stabilization. An enormous number of engineers, contractors, government agency representatives and other professionals lack even a basic introduction to the materials. Firestone's "Unfolding a Roll of PondGard" video is one of more than 20 short videos available for viewing on the company website. Photo credit: Firestone, www.firestonesp.com. The written word is immensely helpful here, but as electronic technologies improve—download and connection speeds, streaming files, etc.—video is playing a greater roll in connecting us to information about and from the geosynthetics arena. It's a dynamic turn in how the industry is able to show you, really show you, how the materials function and, importantly, how they are to be properly handled on site. Moving images do catch the eye. Along with synchronized sound, they simulate the way we absorb information in the world that's just a flick of the eye away from our computer screens. But the Internet is without question an integral part of our working lives. Having access to video through it is a handy tool, particularly for subjects to which we have had less exposure than perhaps we need. The trend towards video online is changing the way we take in information, be it professionally important, such as the weekly Erosion and Sediment Control Network (www.ESCN.tv) broadcasts, or simply for entertainment, such as movie trailers shown on Apple's website and which you might download to your iPod. Even the web's formerly entertainment-only vehicles, such as social networking sites like MySpace and YouTube, are adapting to and being changed by professional uses of video uploads to their sites. For geosynthetics and affiliated materials, it's an important new way to deliver information about the materials to design and construction professionals, if only a little bit at a time. To be sure, they are not a substitute for experience; but every bit of education matters. Manufacturers such as Firestone and North American Green have included video windows on their sites. Clicking on these links opens small "pop-up" video windows that automatically run the selected file without the user needing to download to their own systems. Firestone's site (www.firestonesp.com) includes videos under its "News & Resources" section. In all, 22 videos are available to walk you through the PondGard geomembrane products, from installing the material on a slope to managing pipe penetrations to seaming panels together and making repairs. North American Green's site (www.nagreen.com) includes a number of videos under its "Installation" section. The various sub-categories, from a general introduction to installation on slopes and along shorelines, are covered in easy-to-understand steps. These videos range from 30-second informative glimpses to 8-minute walk-throughs of the process. They aren't going to transform you into an expert installer, but they are very useful for understanding the intricacies of how materials should be used. Firestone and North American Green are not alone in investing in online videos at their site. American Excelsior (www.americanexcelsior.com) - The "ErosionLab" section has numerous downloadable videos from the company's testing facility. Cetco (www.cetco.com/LT) - GCL installation videos can be found under "Resources." Erosion Control Blanket (www.erosioncontrolblanket.com) - Videos of installation equipment and methods are offered…as is ECB's entertaining commercial library. Strata Systems (www.stratasystems.com) - A video (under "Slide Shows") introduces visitors to Strata and its StrataGrid line. Still shots from GSE's GundSeal video. Photo credit: GSE, www.gseworld.com. YouTube.com isn't just for social networking and videos of talking dogs. It's also turning into a pretty potent manner of posting business information. The YouTube approach allows the posting company to embed the video in another website—for example, your own company's website. In this way YouTube serves as an outside source for storing material. This seems to be most advantageous for two types of companies: those just adding their first videos and waiting to develop a larger internet infrastructure in which to incorporate them; and those companies with firmly established video distribution (such as at trade shows, education sessions, and product distributors) but who are looking for some additional outreach opportunities. As of mid-December, not a tremendous amount of geosynthetic material had been added to YouTube, but one can find videos from Houston-based manufacturer GSE (www.gseworld.com) as well as a wedge-welding company, Chinese geotextile-manufacturing machine makers, and even wall-building firms such as Allan Block (www.allanblock.com), which has posted videos for applications such as incorporating geogrid into segmental retaining walls. 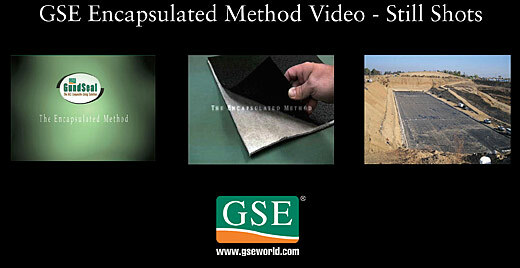 GSE's offerings include informational videos on its StudLiner product for concrete protection and even a rather interesting multi-axial test of an HDPE geomembrane. These are quite useful for understanding how geosynthetics are used in "out of site" applications. (That is, underground.) And when testing videos are available, it helps one understand how carefully engineered the products are, and to what lengths the industry goes to test and approve them before they will include them on a job site. Professional societies are certainly using informational videos in the same manner. 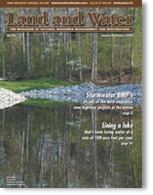 The Erosion Control Technology Council (ECTC) website (www.ectc.org) offers a sharp two-minute preview of its free rolled erosion control product (RECP) installation DVD. Site visitors who decide they would like to acquire the full program may then either request a mailed copy on DVD or download the entire series in four parts (which makes downloading much easier, as video files are often quite large). You'll find the video link at ECTC's site under "Resources." The International Geosynthetics Society (IGS) provides a number of videos and CDs for sale. The videos and CDs focus on application segments: landfills, transportation, soil reinforcement; and are presented by luminaries from the field: JP Giroud, Robert Koerner and Terry Ingold. Members of the IGS can log into the website with their membership number and download the video files, including two with Spanish-language voiceover, though one must budget time as they are rather large downloads (up to 800 MB!). These can found at the IGS' website: www.geosyntheticssociety.org. It seems certain that video technologies will continue to be easier to find and use through the Internet. After all, it wasn't so long ago when the best video feeds online were grainy and frequently interrupted (all that "buffering" that took place). For critical materials segments like geosynthetics this is a very useful and needed opportunity. Again, these videos do not substitute for experience or proper training, but they do offer valuable insight into the field, its product functions, the breadth of its applications, and its available experts. The next time you're online—you may actually be reading this at Land and Water's website (www.landandwater.com) or being educated weekly by video at Land and Water's Erosion and Sediment Control Network TV Station (www.escn.tv)--you might sample some of the aforementioned videos as well as look for other ones when you visit similar sites. For more information, Chris can be contacted at chris@geosynthetica.net.